1 A None No Power Seat 1 A is a standard Business Class Bulkhead seat, however the close proximity to the galley may be bothersome. 11 A None No Power Seat 11 A has limited or no recline due to the Exit Row in back. 11 C None No Power Seat 11 C has limited or no recline due to the Exit Row in back. 11 D None No Power Seat 11 D has limited or no recline due to the Exit Row in back. 11 F None No Power Seat 11 F has limited or no recline due to the Exit Row in back. 12 A None No Power Seat 12 A has extra legroom due to the Exit Row in front. This tray table is in the armrest, making the armrest immovable and slightly reducing seat width. 12 C None No Power Seat 12 C has extra legroom due to the Exit Row in front. This tray table is in the armrest, making the armrest immovable and slightly reducing seat width. 12 D None No Power Seat 12 D has extra legroom due to the Exit Row in front. This tray table is in the armrest, making the armrest immovable and slightly reducing seat width. 12 F None No Power Seat 12 F has extra legroom due to the Exit Row in front. This tray table is in the armrest, making the armrest immovable and slightly reducing seat width. 29 A None No Power Seat 29 A is in the last row of the plane and has no recline due to the exit row behind. The proximity to the lavatory and galley may be bothersome. 29 C None No Power Seat 29 C is in the last row of the plane and has no recline due to the exit row behind. The proximity to the lavatory and galley may be bothersome. 29 D None No Power Seat 29 D is in the last row of the plane and has no recline due to the exit row behind. The proximity to the lavatory and galley may be bothersome. 29 F None No Power Seat 29 F is in the last row of the plane and has no recline due to the exit row behind. The proximity to the lavatory and galley may be bothersome. This ERJ 190 is a regional jet serving short-haul destinations. All seats in row 29 do not recline at all. 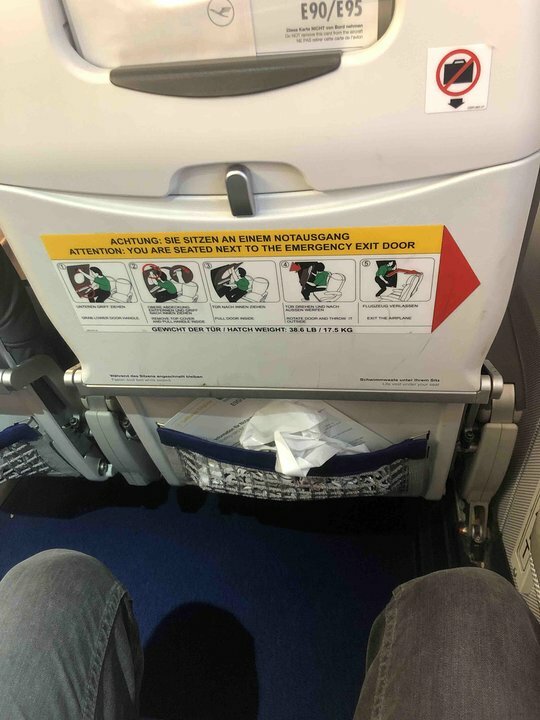 Seats and legroom were nice. Typical good Lufthansa service. Will fly with them again. Lufthansa flies 1 versions of Embraer ERJ-190.